Cut Diplomatic Ties? Hide Him In A Crate? How Might Assange Standoff End? : The Two-Way As the WikiLeaks founder remains holed up in Ecuador's London embassy, theories are emerging about how British police might get to him — and how he might be able to avoid arrest and get out of the country. 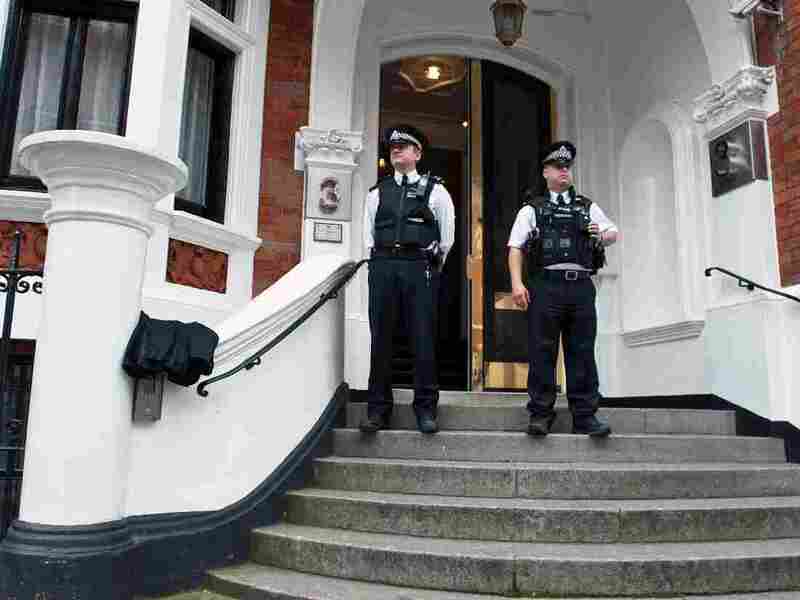 Metropolitan Police Officers outside the main door of the Ecuadorian embassy in London. WikiLeaks founder Julian Assange is inside. Now that Ecuador has said it will give WikiLeaks founder Julian Assange asylum as he seeks to avoid being extradited from Great Britain to Sweden by hiding out in Ecuador's London embassy, news outlets are looking at the complicated legal issues involved in cases such as his. Can the U.K. revoke its recognition of the embassy, which would then give police the right to enter and arrest Assange? Britain's 1987 Diplomatic and Consular Premises Act "does indeed give ministers a power to withdraw recognition from diplomatic premises," writes The Guardian. Our earlier posts about Assange, WikiLeaks and why Swedish authorities want to question him, are collected here. But the U.K. would also have to comply with the Vienna Convention on Diplomatic Relations, and that requires Britain to help Ecuador obtain a place in London for its mission. So, legal blogger Carl Gardner writes in a post picked up by the Guardian, "it's not obvious [the Vienna Convention] allows the U.K. to just de-recognise the current premises without helping arrange something new." Could he get into a vehicle with diplomatic plates and avoid arrest? The BBC writes that "assuming Julian Assange evaded arrest outside the embassy, he could get into a diplomatic car. These vehicles enjoy protection in international law from 'search, requisition, attachment and execution.' That could lead to the curious legal position of the [police] having the power to stop the car — but no power to search it for Julian Assange. Even if he got away, at some point he would have to get out of it into an aircraft - at which point the risk of arrest would return." What about a diplomatic "pouch?" "Diplomatic bags can be any size that the country wants them to be and they cannot be opened or detained in transit," the BBC says. But, it adds, "the law says they are for official materials, so it is difficult to see how Julian Assange could be put in a crate and shipped out — not least because the British authorities would have a fairly clear idea what was in the box." One suggestion — end diplomatic relations. "If I were advising the government, I think I'd say that, if ministers are determined to allow the arrest of Assange, it might be better simply to cut off diplomatic relations with Ecuador, send the ambassador home, close the embassy and arrest Assange after that. Ending diplomatic relations is the major sort of foreign affairs decision I doubt the courts would interfere with. But that'd be a major diplomatic call." Or, make him an Ecuadorean citizen and ambassador? "The Ecuadorean Government will need to grant him immediate citizenship and appoint him Honorary Consul, or better, UK or UN Ambassador and issue him with a diplomatic passport. Anything less will not work as the British authorities have upped the stakes and made it patently clear that they will ignore protocol and conventions to arrest Assange even if he is granted political asylum. With his diplomatic immunity of this order, if Assange chose to leave Britain he should do so by private plane, organised by Ecuador and within 31 days." British diplomats have "all the trump cards in their hands," says retired British ambassador Oliver Miles. "There's nothing the Ecuadorians could do to make life difficult for the British." But the U.K., he told NPR's Melissa Block this afternoon, has several options available for pressuring Ecuador — up to ejecting its ambassador and closing the embassy. Ecuador would surely respond by closing the British embassy in Quito, but that would not be a great blow to the U.K.
Much more from the conversation with Miles will be on today's All Things Considered. Click here to find an NPR station that broadcasts or streams the show. Later, we'll add the as-broadcast version of the interview to the top of this post.